Finally had the chance to meet up with another member from MFWL who stays and work in KL. how glad I was as she is a close friend in MFWL who is selfless and always ready to help. 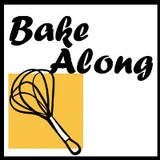 Simply love the platform MFWL has provided that allows me to connect with many ppl who loves to bake as much as I do. So what shall I make for her since she is always so far away to try my baking... Finally settled on something I would like to challenge as it is a bit different from Kueh Bahlu - Madeline! So, gotten tis recipe from Joyofbaking. Find that it is quite straight forward as it doesn't require to leave batter overnight in fridge, and jus need a mere 30mins. I added a tsp of lime extract to have that buttery, lemony feel. It is indeed yummy that my kids, including my hubby who couldn't stop eating. I sincerely hope my friend will love it. 2) Beat eggs and sugar til ribbon stage. Add in vanilla extract and lime juice. 3) Fold in 1/3 of sifted flour (with salt and baking powder) gently. Then add in remaining flour. 6) Preheat oven to 190deg. Put a tablespoon of batter into greased Madeline mould and bake for 8-10mins til top is browned.